The Penn State Nuclear Engineering Society (PSNES) is a group of Penn State nuclear engineering alumni as well as other Penn State alumni and friends of the nuclear engineering program. The purpose of this society is to promote fellowship and communication among the alumni, faculty, and students to improve the program, the department, the college, and the Radiation Science and Engineering Center (RSEC). If you are interested in learning more about volunteer opportunities with PSNES, please email one of the PSNES Officers. The PSNES mentoring program is aimed at helping students reach their professional goals in the field of nuclear technology. PSNES is always looking for mentors for this student-driven program. 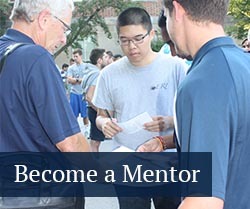 Find out more about the mentoring program. PSNES Encourages communication and networking between nuclear technology students and alumni. Club officers participate in each PSNES meetings and PSNES provides on-campus speakers, mentoring/networking opportunities, and project collaboration. PSNES has purchased a time capsule to honor the long, illustrious history of the Penn State Nuclear Engineering Programl. Once PSNES identifies, obtains, and prepares all the items, the time capsule will be sealed and housed in the new E-Knowledge Commons in the Reber Building. To become a member, please complete the membership form online. All graduates of the Penn State Nuclear Engineering program can join, and there are no dues or fees. All members are encouraged to participate in the Board of Directors' meetings via teleconference and at the annual on-site meeting. Penn State graduates who are not nuclear engineering graduates but desire to become a member of PSNES can do so by either self-nomination or by nomination by a member. When appropriate, the board of directors may designate non-alumni as honorary members in recognition of acknowledged eminence in some area of engineering or who have rendered outstanding service to the nuclear engineering program. If you are a PSNES member, you can update your preferred email contact address online. To update your personal information such as mailing address, phone number or place of employment, contact Arthur Motta, chair of the nuclear engineering program at 814-865-0036 or by e-mail at atm2@psu.edu.